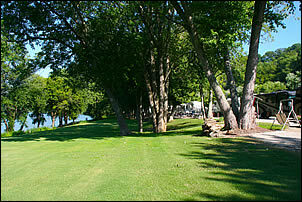 RV camping is available nightly or seasonally from May through October. All RV campsites are Full Hook-Up (newly redone), including sewer, water and 30/50 amp electric service, with a provided picnic table and fire ring. 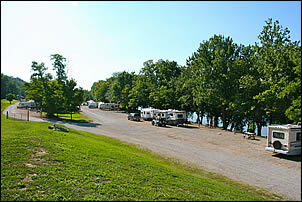 RV campsites (riverside and interior) are approximately 40' W x 60' L. Each campsite is surfaced with packed gravel to the main campground roadways. 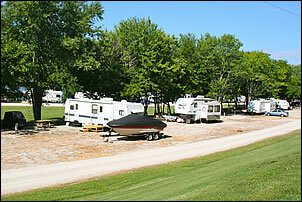 Each Full Hook-Up site is designed to hold an RV, vehicle and recreational boat trailer. Guest and visitor parking is available. 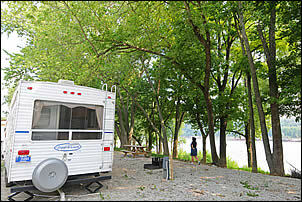 Campground rules are designed to promote family style camping, safe and enjoyable experiences. Campground security is provided and rules are enforced. Board of Health Regulations prohibits tents and outside sleeping shelters at this campground.